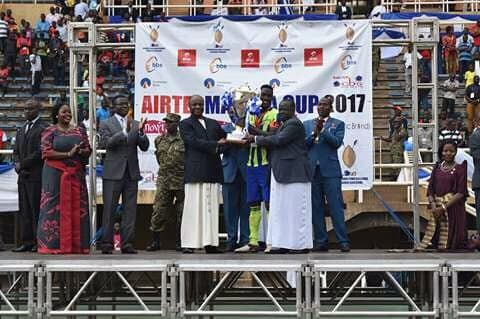 Yesterday Saturday 27 October 2018 was another special day for Ssingo supporters after their memorable win against Buddu in the Buganda Kingdom Airtel Masaza cup held at Namboole National Stadium on penalties 12-11. In the finals played, both teams were locked at 1-1 after 120 minutes requiring the spots to determine the overall winner of this year’s trophy. In the penalties, Buddu team missed 2 of the 13 kicks while Ssingo only missed to hit the back of the net once hence win their second ever Masaza cup Trophy. Buddu looked to be the better side in the first half but could not score against Ssingo in the first hence a 0-0 draw in the first 45 minutes. Just eight minutes in the second half, Buddu through Frank Ssebuufu broke the deadlock and put the 2015 champions 1-0 up. Ssingo FC’s coach Shafi Bisaso’s tactical knowledge forced him to bring youngster Godfrey Kakooza for Mansoor Safi on the pitch whose move changed the game to 1-1 draw in the first 90 minutes. After the two teams failed to score in the remaining minutes, extra time was for the first time in the competition used to try and determine the winner. The teams were now given more 30 minutes to decide the winner and then the title’s destination was left to be decided penalties. This was the first time in Masaza cup history that a final went into extra time. Both Ssingo and Buddu converted their first 6 penalties before the first miss. Both goal scorers, Godfrey Kakooza and Frank Ssebufu failed to score their penalties and this made the cycle of penalties to continue up to the 13th kick. The winner was decided by Derrick Were’s strike that put Ssingo ahead of Buddu. For Buddu, they will go back home hurting after losing to Ssingo in yet another final after the 2015 finals 5-0 loss to Ssingo. 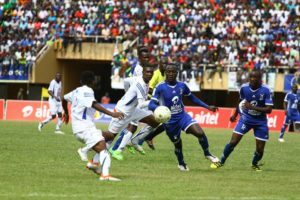 In the third place Busujju defeated Buwekula in 1-0 win at Namboole. At the end of competition, Ssingo’s Jude Ssemugabi emerged as the tournament’s top scorer with 8 goals while Buddu’s Owen Kasule was voted the most valuable player as Busujju Sharif Magoola took home best goal keepers gong. The title was handed over to Ssingo by His Highness the Kabaka of Buganda Ronald Muwenda Mutebi II in the presence of Buganda Premier Charles Peter Mayiga among others. Congratulations to Ssingo FC for winning this year’s Masaza trophy from Flash Uganda media.